I want to thank you for supporting this blog and invite you to celebrate with me...we have passed the 21,000 visitors, 38,000 page views from over 100 countries mark and all this just since the end of September!!! I hope you will continue to support the mission of this blog with your prayers, your visits, sharing this blog with others, linking to this site, (making it one of your favorites at Technorati would greatly help it's visibility) and even consider a small donation in the upper right corner - no amount is too small and would be greatly appreciated! Special hugs to the 30 people who have chosen to "follow" this blog so far. You encourage me every time I log on to work!!! *hugs* May God use this effort for His kingdom! Tomorrow I'll have an adorable template for a heart shaped puzzle made with the Love Bear Frame for you and an offer for the puzzle I received yesterday that's only good till the 9th for only $3.99 and free shipping! I have ordered six myself to give away! I hope you love it too, so be sure to come back tomorrow! these are so stinkin cute! Thanks! What a beautiful work you did !! And this is a very original idea to have one adorable little bear hold a photo ! Bravo and again bravo to the talented Artist ! 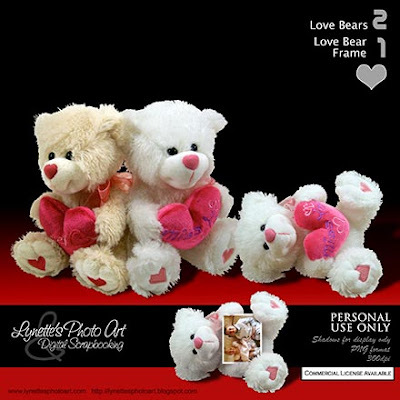 These Bears look Adorable, thanks so very much for sharing!!! !